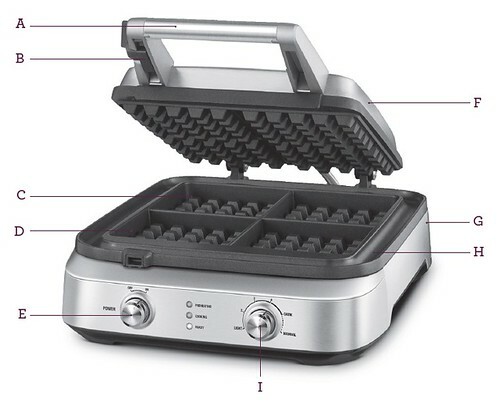 The Smart Waffle™ 4-Slice — With a No-Mess moat, non stick plates, Waffle IQ™ and 5 different darkness settings as well as a manual setting, it’s the perfect waffle every time. A. Cool-Touch Handle. B. Locking Latch. C. Die-cast Aluminum Cooking Plates. D. PFOA-free Non-Stick Coating. E. POWER Dial. F. Stainless Steel Housing. G. Breville Assist® Plug. H. Integrated Moat.